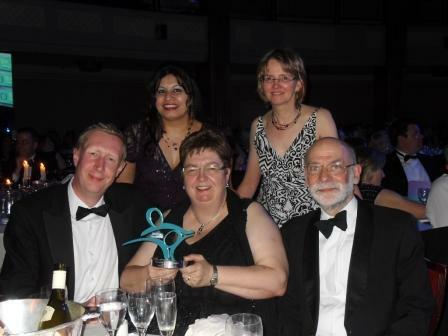 A team put together by Sandwell and West Birmingham Hospitals NHS Trust (SWBH) have scooped a national award for their contribution to making prescribing medicine safer. Professor Liz Hughes, Professor Robin Ferner and Emma Graham-Clarke took the lead on SCRIPT, an e-learning platform for junior doctors which has helped them become safer and more effective at prescribing medicines, which has won the Improving Safety in Medicine Management award at the Patient Safety Awards 2013. The 40 module system, which tests students before and after each block of modules to measure their improvement, was the culmination of work by SWBH, Health Education West Midlands, and experts from the University of Birmingham, Aston University and the University of Warwick. Emma Graham-Clarke, Consultant Pharmacist, said: “We are delighted to win the award. We had marvellous feedback from juniors who had used SCRIPT, and were pleased that several other regions have adopted it. We knew had something good, but we were all really jubilant to get national recognition for our work. The idea was formed in 2009 by Professor Hughes as a reaction to a study which showed that many junior doctors were not prescribing as well as they should be. The West Midlands project has now been rolled out nationally, with eight areas currently using the modules, including East Midlands, and is getting interest globally, even from as far as Australia. The consortium, who were shortlisted for a BMJ award last year, are now adapting the modules to provide learning opportunities for non-clinical prescribers and dentists.